The scholarship on Italian Neorealism is alive and well. The small group of films which typified post-World War II Italy still stimulates scholars in Film Studies and Italian Studies. 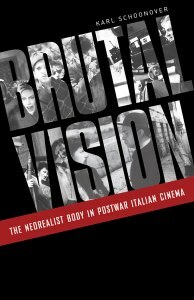 Hence it is no surprise to read about a new publication, Brutal vision: The Neorealist body in postwar Italian cinema, by Karl Schoonover, assistant professor of Film and Television Studies at the University of Warwick. He outlines the scope of his book very clearly at the beginning of the introduction: “I argue that neorealism’s interest in detailing the brutalized human body also underwrites the emergence of a new visual politics of liberal compassion that I call brutal humanism”. He describes how the films analyzed in the book “use scenarios of physical suffering to dramatize the political stakes of vision and the need for an outside extranational eyewitness” (xiv). The notion that this new spectacle has international spectators is central to the argument of the book: Schoonover repeatedly emphasizes the global character of these films, devoting several pages (69-108) to describing the marketing campaigns that promoted them in the United States, and focuses on how neorealism collaborated “with the liberal rhetorics of postwar reconstruction that prioritized expanding commodity capitalism over endorsing local forms of sovereignty” (xv). This strategy is employed, Schoonover claims, thanks to a scenario that is repeated again and again in “the most internationally successful neorealist film”: as he claims, “an imperiled body is offered to a bystander’s gaze as an opportunity to exercise ethical judgement” (xvi). Although, if describing the most internationally successful neorealist films succeeds in addressing these issues, Schoonover’s approach may seem at times somewhat narrow, considering that he deals in detail with only a few films out of the ample neorealist body (comprising fifty-five films, as Christopher Wagstaff claims, or even more, according to other sources ). The book is divided into five chapters. The first is dedicated entirely to André Bazin and his formulation of neorealism. Schoonover emphasizes the French theorist’s “transcultural legibility”, i.e. how he sees Italians in these films as different from each other and ethnically complex, and how it therefore seems inappropriate to formulate an idea of neorealism as national cinema. The second part of this first chapter focuses on the scholarly attention that has been given in the last years to exploring the role of the body in Bazin’s writings (as part of a more general Bazinian rediscovery). The second chapter focuses on the reception of neorealist films in America, and mainly on their advertising strategies. The third and fourth chapters deal with, respectively, films of Roberto Rossellini and Vittorio De Sica, while in the fifth Schoonover briefly analyzes films of what he calls the second generation, namely Michelangelo Antonioni, Marco Bellocchio, Bernardo Bertolucci, Federico Fellini, and Pier Paolo Pasolini. In the conclusion he expands the range of his discussion, touching on some quite controversial issues. For instance, neorealism has been considered a breakaway, a watershed in cinema history, introducing new and even revolutionary ways of staging suffering and empathy. According to common and canonical theories, it does so by siding with the poor, the outcasts, and the working class; the display of their suffering is not gratuitous, but on the contrary it is a sort of political act whose aim is the construction of a better world, society, or nation (here I am oversimplifying for the sake of brevity). Schoonover is critical of this shared understanding of the impegno of neorealism throughout his book, but it is in the last pages that he does so most powerfully. He recounts the story of the meeting of the Cuban filmmaker and theorist Julio Garcìa Espinosa (the author of “For an imperfect cinema”) with Lamberto Maggiorani, the non-professional actor and protagonist of Bicycle Thieves (1948); Garcìa Espinosa discovered that Maggiorani’s participation in the film did not ultimately help him to live a more dignified life: “It is plain that meeting Maggiorani forced Garcìa Espinosa to confront the limits of the neorealist aesthetic. His message is clear: postwar Italian film’s implementation of human suffering formalizes the structures of charity, but its gestures guarantee nothing for the future” (227). Perhaps one of the few limitations to Schoonover’s book is how he fails to mention – or more accurately he does so only briefly without building an argument around it – the imperiled and suffering body par excellence of mid-century Europe: the Jewish body. One might say that Jews are not present in neorealist cinema; in fact there is an almost complete absence of them in Italian postwar cinema. But this absence of such a major aspect of the period, when images of the concentration camps and of the emaciated bodies of survivors circulated in Italy (not very widespread, but they were seen), is in itself an issue which would have been interesting to discuss in a book focused on witnessing and global humanism. This absence might also point to the limits of representation in neorealist cinema: whereas the tortured body of Manfredi in Rome Open City (1945) is still an almost watchable image (almost, because the copy that circulated in the Anglophone world was highly censored), the bulk of corpses amassed by the Nazis were not. To conclude, Brutal vision brings together film theory, close readings and a scholarly understanding and explanation of the social, political and economic contexts in which these films were produced and distributed. If one can follow his complex, rich, and dense prose, one does not feel lost in Schoonover’s book, because he carefully provides the exact space-time coordinates for understanding the issues at stake in his book – and eventually neorealism at large. Christopher Wagstaff, Italian Neorealist Cinema. An Aesthetic Approach, University of Toronto Press, Toronto-London-Buffalo, 2007: 435.